Wet weather has many producers putting up hay much later in the season than normal. Photo credit Troy Walz. 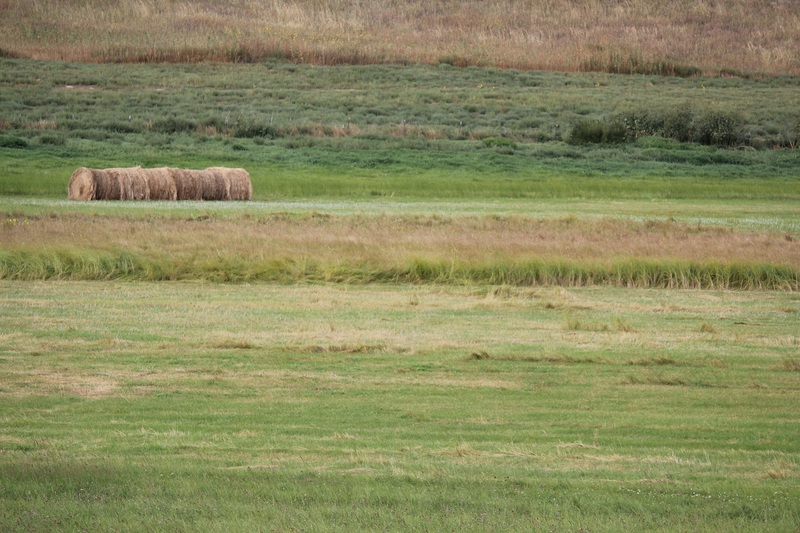 During a normal year, hay harvest starts in late June or early July when quality is generally higher at over 10% crude protein (CP) and >50% total digestible nutrients (TDN). The higher quality is due to a higher leaf to stem ratio, as leaves are higher in protein and energy. A delay in cutting and harvesting until late-July or August can have a negative impact on quality. Stems and seedheads are lower in protein and energy, so as grasses mature later into the season forage quality declines. For many this year, haying season was delayed into August or even into September, when grasses are “stemmy” and fully matured. Further impacting hay quality was the exceptional rainfall itself. In wet years, forages tend to grow more rapidly and mature quicker, which may decrease overall forage quality and require additional supplementation to meet cow nutrient requirements. It is important for producers to react to a cow’s changing nutrient requirements depending on if the cow is lactating or stage of gestation. For example, a 1,200 lb. gestating cow may need 1.5 lb. CP daily in its diet to maintain body condition. Compare that with a 1,200 lb. lactating cow that may need 3 lb. CP per day. The crude protein requirements will vary for each animal depending on a cow’s weight and pounds of milk produced. It is important to understand cow weights and milk production in a herd, for a producer to balance nutrient requirements without over or underfeeding. With most management decisions, the more information we have to plan the better outcome we can achieve, and for a livestock producer that would include having harvested feed analyzed. Sample hay according to lots, typically less than 100 ton of hay that is grouped by bales of the same forage type, harvested in the same area, and harvested at a similar time. Take multiple samples per lot (15-20 round bales should be adequate) and use a mechanical probe to core and collect a sample (15-20 cores). Detailed instructions on how to properly sample hay can be found in the “Sampling Feeds for Analysis” NebGuide # G331. If available forage or harvested feedstuff does not meet the protein needs of the animal, supplementing protein from other sources would be the next step. Common methods many producers use to provide protein are lick tubs and range cubes. Alternative feedstuffs can be utilized to meet protein needs and may be a more cost effective option if proper storage sites and feeding equipment are available. Examples may include dried distillers grains, cottonseed meal, sunflower meal, and canola meal. To decrease supplemental costs, producers should price supplements on a $/lb. of CP basis rather than $/ton basis. The “Buying Supplements” article covers how to make direct comparisons of supplements. Workshops will cost $15 per person with a Ranch Discount of $10 per person for groups of 3 or more. Attendees are encouraged to bring in their own feed or hay analysis to discuss and interpret. A meal is provided so please RSVP one week prior.